Loss of safety control (i.e., “dangerous condition” or “risk event”). All of these elements factor into what a risk is. The one common factor in nearly all risk management activities is the use of the risk matrix, as it's the most efficient tool to document severity and probability. 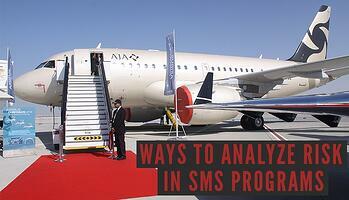 Here are 5 ways to analyze risk in SMS programs. Where the safety program needs further risk controls. Historical analysis is probably the most common way to analyze risk, and should be the first type of risk analysis activity that SMS programs implement. All of these activities are designed to seek out exposure before accidents occur. Scenario analysis is a predictive risk management activity. It is used when safety management needs to consider how the safety management system will perform in hypothetical situations (that have not occurred yet). Goals of Scenario Analysis are to “stress test” the SMS program to see how it handles novel situations. These tools don’t actively identify how the SMS program failed. The outcome of performing this analysis is a chart which visually identifies the extent and makeup of the failure, as well as a table that specifically identifies the different failures. It is called SMS Shortfall Analysis because this it is a discovery tool for understanding the shortcomings (i.e., shortfalls) of your SMS program in safety incidents. The interceding events between the hazard and each outcome. Depending on how many interceding events can lead to certain outcomes, you can establish which outcomes are most likely in terms of probability.